This makes a great dinner in thirty minutes! I always love a one-pot meal, like this Glazed Salmon Bowl with Pineapple Quinoa, that includes as many food groups as possible — and this one is also chock full of nutrients and flavor! After winter’s slightly heavier dishes like stews and soups, we tend to crave fresh and gentle flavors as we enter spring. 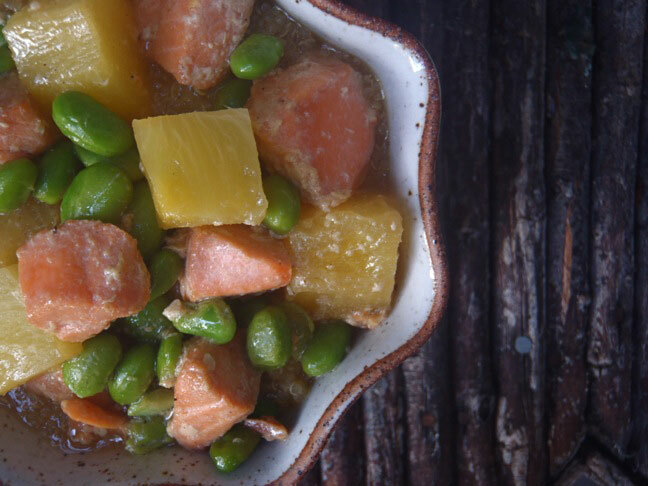 This entree is like a stew, but it’s very refreshing and light. I’ve found that many kids like salmon and if you add a little natural sweetness, they’ll love it! Cut the salmon into about 1-inch pieces. In a medium-sized mixing bowl, whisk the honey, soy sauce, and garlic together. Add the salmon pieces to this marinade, making sure they are all coated well. Let this sit — moving the salmon around once or twice — for about 10 minutes. Drain the juice from the can of pineapple chunks and pour it into a medium-sized saucepan. Set the chunks aside for later. (The juice should measure exactly 1 cup.) Add 1 cup of water and the rinsed quinoa to the pan with the juice, and bring to a boil. Reduce to a simmer, cover, and cook until all of the liquid is absorbed and the quinoa looks somewhat translucent, about 20 minutes. Coat the bottom of a large saute pan with the oil and place over medium-high heat. Once the pan is very hot, add the salmon (with the marinade.) After a minute or so, gently stir the salmon around the pan a bit to make sure all the sides are cooking evenly. 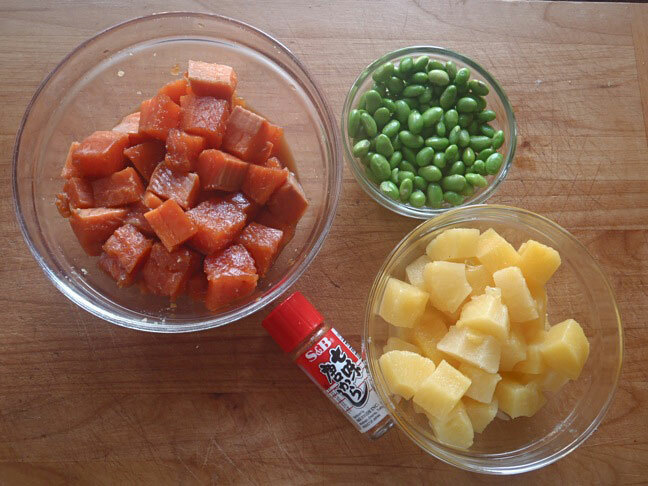 Once the fish is almost cooked, after about 4 minutes, add the edamame and pineapple chunks. Cook for another couple minutes to combine the flavors and to finish cooking the salmon. Season if necessary with salt and pepper. And for extra spice, add a sprinkling of Togarashi. Remove the quinoa from the stove and season to taste with salt and pepper, and then add it to the pan with the other ingredients. Once it’s all mixed together, season to taste again if necessary. If you don’t have quinoa on hand, any rice, couscous, or pasta would be great, too. When soy sauce is present in a recipe, the dish rarely needs much salt if any. Taste before you season! Togarashi is the Japanese word for red chili peppers. You can find Togarashi in most Asian markets and sometimes in the Asian section of larger markets.